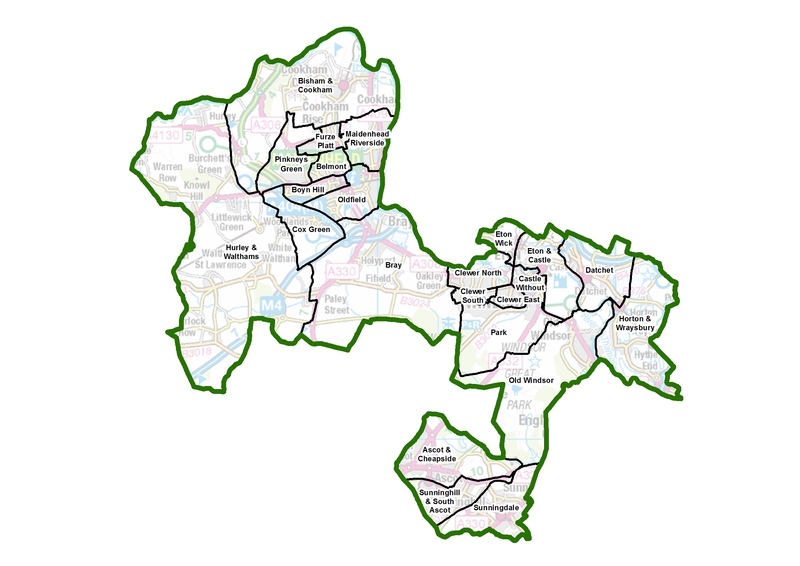 The independent Local Government Boundary Commission for England is asking local people for their help to draw up a new pattern of council wards for the Royal Borough of Windsor and Maidenhead. The consultation is the first part of an electoral review which will re-draw ward boundaries across the borough. The Commission has also announced that the Royal Borough should have 43 councillors in future: fourteen fewer than the current arrangements. The Commission now needs information from people and groups across Windsor and Maidenhead to help it to produce a new pattern of wards to accommodate 43 councillors. In drawing up new boundaries, the Commission aims to deliver electoral equality for voters in council elections so that each councillor represents roughly the same number of voters. The review also aims to ensure that the new council wards reflect, as far as possible, the interests and identities of communities across Windsor and Maidenhead. Professor Colin Mellors, Chair of the Commission, said: “We are asking local people and organisations to help us draw up new wards for Windsor and Maidenhead. As we develop the recommendations, we will take into account local community identities as well as ensuring electoral equality for voters. “If you have a view about which communities or neighbourhoods should be part of the same council ward, then we want to hear from you. And if you think a road, river or railway makes for a strong boundary between communities in your part of Windsor and Maidenhead, then this consultation is for you. “We will carefully consider all evidence that is provided during this phase of the review whoever it is from and whether it applies to the whole of Windsor and Maidenhead or just a small part of the council area. Local people have until 4 December 2017 to submit their views. Further information on the review and interactive maps of the existing wards can be found at consultation.lgbce.org.uk and www.lgbce.org.uk. 1. The Local Government Boundary Commission for England is responsible for reviewing local authority electoral arrangements, defining boundaries for local elections and the number of councillors to be elected, as well as conducting reviews of councils’ external boundaries and structures. 2. The aim of the ward boundary changes is to provide for ‘electoral equality’; that means each councillor representing approximately the same number of electors. The Commission must also have regard to community identity and interests and providing effective and convenient local government. 4. Residents have from 26 September until 4 December 2017 to have their say about where ward boundaries for Windsor and Maidenhead’s 43 councillors should be drawn. The Commission will then publish its draft recommendations in February 2018 and open a further phase of consultation with local people. New wards are scheduled to come into effect at the 2019 council elections. 5. The electoral review of the Royal Borough of Windsor and Maidenhead is a separate undertaking from the review of parliamentary constituency boundaries which is being carried out by a separate body (Boundary Commission for England) under different rules and legislation.